Kiwifruits, or kiwi, is an edible berry about the size of a chicken egg. It features a fuzzy peel that surrounds a green fruit with black seeds and a creamy white center. Kiwis taste slightly sweet and tangy with a creamy texture. It is available year-round in most grocery stores and is often eaten alone or as part of a salad, on fruit tarts or in smoothies. In addition to counting as 1/2 cup, or one serving, of fruit, according to the U.S. Department of Agriculture Food Guide Pyramid, kiwis offer a wealth of nutrients. One cup of sliced kiwifruit provides 5g of fiber. The Institute of Medicine recommends most adult women consume at least 25g of fiber daily and men, 38g. Fiber can help fill you up, keep your digestive system running well and may help lower cholesterol. In 1 cup of kiwi, you get over 270 percent of the recommended dietary allowance for vitamin C. Vitamin C acts as an antioxidant, scavenging free radicals in your body to help prevent disease. It is also essential to the formation and repair of tissue, particularly cartilage, blood vessels, tendons and skin. Kiwi is also a source of vitamin K, with 1 cup offering 89 percent of the RDA. Vitamin K helps with blood clotting and absorption of vitamin D. Kiwi also provides 13 percent of the RDA for vitamin E and 11 percent for folate in a 1-cup serving. Potassium is a mineral that helps keep your body’s fluids and other minerals in balance. Too little potassium may lead to weakness, stroke and irregular heartbeat. One cup of kiwi contains 552mg of potassium, more than the 467mg found in a small banana. A potassium-rich diet helps to control blood pressure. Choosing kiwifruit as a snack in lieu of higher calorie fare can help you control your weight. One medium-sized fruit has just 46 calories, and a full cup of kiwi slices contains 108 calories, about the same amount as a medium banana. 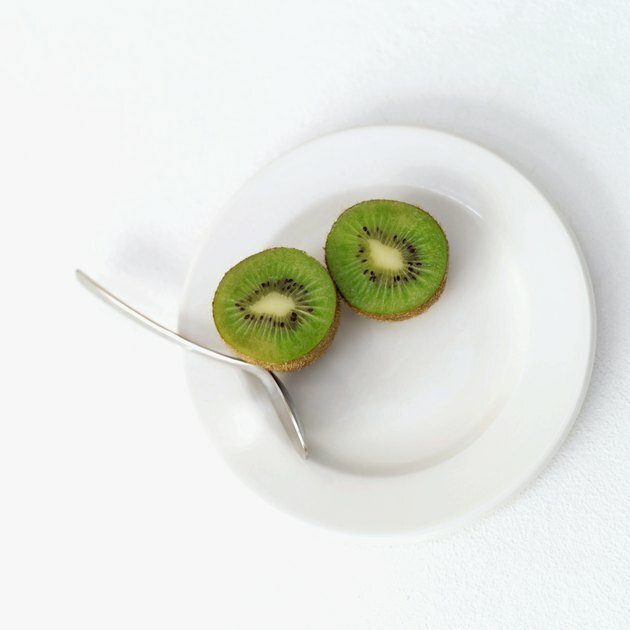 Use kiwi to replace half of your morning cereal to save calories; add it to cottage cheese for a high-protein, low-calorie snack; or blend it into a smoothie with mint leaves and strawberries. How Many Calories Does a Peach Have?